We spent this past weekend in Omaha visiting my Gram and other family members from my dad's side. It was such a treat and we had so much fun together. While we were there, Gram pointed out that we were coming up on the first anniversary of her heart surgery. Today is the day. Gram is doing so very well; she will, Lord willing, celebrate her 90th birthday on Valentine's Day. We enjoyed listening to many hilarious and/or touching stories from her younger years, as well as taking in some Omaha fun. But without further ado, I give you last year's post on this very day. Be encouraged, friends, the Lord is faithful. Gram is quick to remind us to trust in Him alone. This morning, my Gram will go in for heart valve replacement surgery out in Omaha, NE, my dad's homeland. I spoke with her last week and yesterday and want to share this part of her story. In August, the week before one of her sons was to marry in Chicago, she just wasn't feeling well. She decided a visit to the doctor would be wise, so nothing happened to her on the flight or at the wedding. The doctor took some pictures of her chest, looked at them, and came back to ask her which hospital she'd like to go to. She asks, "When?" His answer? "Right now." What followed was a week in the hospital full of tests, as she had congestive heart failure. She said getting to the doctor was just the beginning of God taking care of her through this process. She missed her son's wedding, but an internal heart problem she didn't even know she had was caught. After the week in the hospital, when the test results were all back, she was presented with her options: let things run their course (her lungs could continuously fill with fluid and need to be treated with meds or other methods) or open-heart surgery. How does one even make the decision? She decided to schedule the surgery and had a few weeks to wait for the Sept. 12 date. Meanwhile, she asked us to pray for wisdom and guidance; was this surgery really the right thing? She has a couple of children in town there in Omaha, and a few spread out. One, my aunt Jill, in Alberta, Canada, went down for a visit before the surgery. 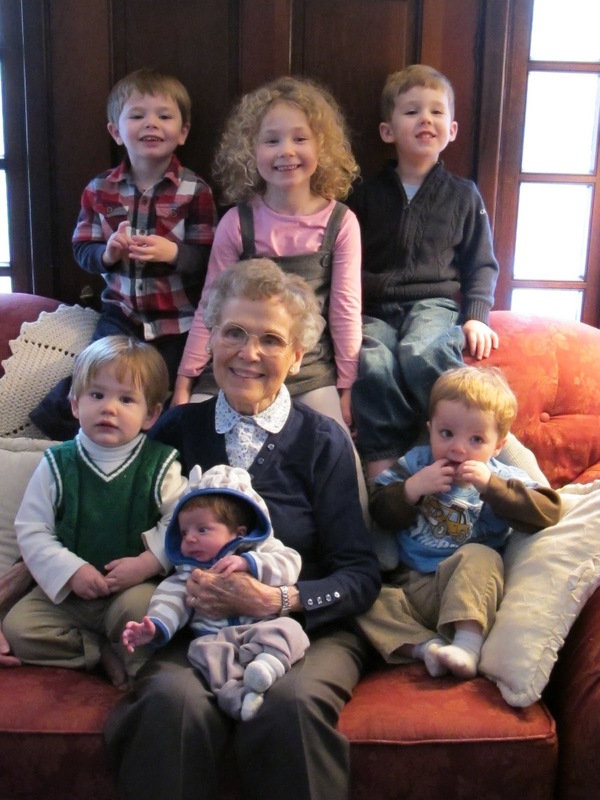 When she left, Gram said she laid down on her bed and said to God, "Give me some peace about this decision, Lord." And five words came into her mind: My peace, My presence, My power, My protection , and My provision. And when she "heard" the word provision, she had her peace. She knew in her heart of hearts that God had spoken to her and that his provision was the surgery. My dad had planned a trip out to be there over the surgery. But as God would have it, the surgery had to be postponed due to an infection. Gram thoroughly enjoyed her visit with my dad and the waiting for the surgery continued. Another little gift from the Father. My favorite quote from her on the phone last week was this, "If God's got something more for me to do, then I'll be here a little longer. If not, then I'll be in heaven." That's faith, folks, trusting that GOD knows what is good and right, has plans for you, and will see them to completion. Then yesterday, she mentioned that if she's not able to live alone after the surgery, then she'll just change addresses. Walking by faith, we can see the possibilities and fear none of them, for we know we have a heavenly Father who is caring for us. The infection has cleared and this morning at 10:30CT, the surgeons will begin their amazing work of replacing a faulty valve with a healthy one. And we pray that God will guide them in their work and His will be done in my Gram's life. And what a life it has been - she has so many stories - a lengthy testimony to God's faithfulness in calling people to trust Him and growing them into steadfast believers who walk with Him all the days of their lives, and one day, through pearly gates onto the streets of gold where there is a river whose streams make glad the city of God! Correction: the surgery started at 7:30 and will be over at 11:30. I misheard yesterday on the phone. Either way, thanks for praying!